I am so excited to share this tutorial on how to make table linens with all of you. As many of you know, I don’t sew. Not even a button onto a shirt. I’ve completed a couple of no sew projects like my No Sew Highchair Tutu and my No Sew Lamp Shade Redo and each time I am completely astounded. These table linens are no exception. I adore them! Plus, they were so simple, which is key for me. I was lucky enough to have Jo-Ann Fabrics reach out to me to try out the new HGTV Home line of home fabrics and trim. I knew I wanted to create table linens with the fabric that was sent because the colors were perfect for outdoor entertaining. I started out with a finished placemat in order to measure how large I wanted my placemats to be. I left about an inch on each side so that I could use the fabric glue to glue down the edges. The print of the fabric made it easy to keep straight edges, which for me is vital because I’m terrible at leveling things off. The final steps were to create an accent piece. I used the orange trim to create a flower accent for the corner of the table linens. I once a gain used the fabric glue to create the flowers. Rather than gluing the flowers to the table linens, I used a safety pin to attach the flowers. This way it will make it much easier to clean the linens without the chance of ruining the flower accent. The flower accent gives the table linen a little extra pop of color. Plus, I can use the flower on other linens or projects because I attached it with a safety pin, rather than making it permanent. 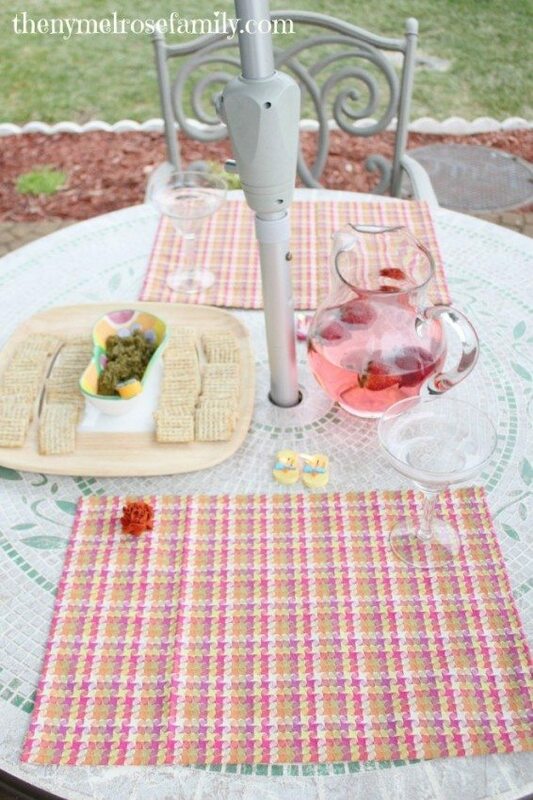 The table linens were the perfect addition to my outdoor evening of appetizers and punch with a neighbor. I served up my Kale & Spinach Pesto served on Triscut crackers and made my Strawberry Punch with a non-alcoholic twist. It’s always nice to relax with good friends and food. Especially when it looks so pretty! You can find Jo-Ann on Facebook, Twitter and Pinterest. I received the fabric and trim from Jo-Ann Fabrics as compensation for this article. The opinions expressed are 100% mine. Now here’s the best part! From April 14th to May 4th the HGTV Home line is 50% off at Jo-Ann. Plus, I’ve got an extra 10% off coupon for you to use as well that is good until May 4th! So great Jenny! I need to try this. I cannot sew at all, no joke. Me neither. That’s why I love fabric glue. Clever and the fabric is so pretty! Thanks so much Mel. The fabric definitely screams Spring and Summer. I can sew, but my machine isn’t working properly so this project is perfect for a project I have been wanting to make! My sister gave me a beautiful butterfly bowl for my dining table and the butterflies are embeded in the glass and I don’t want to put anything in it, but I want to make a runner, but from side to side not lengthwise. 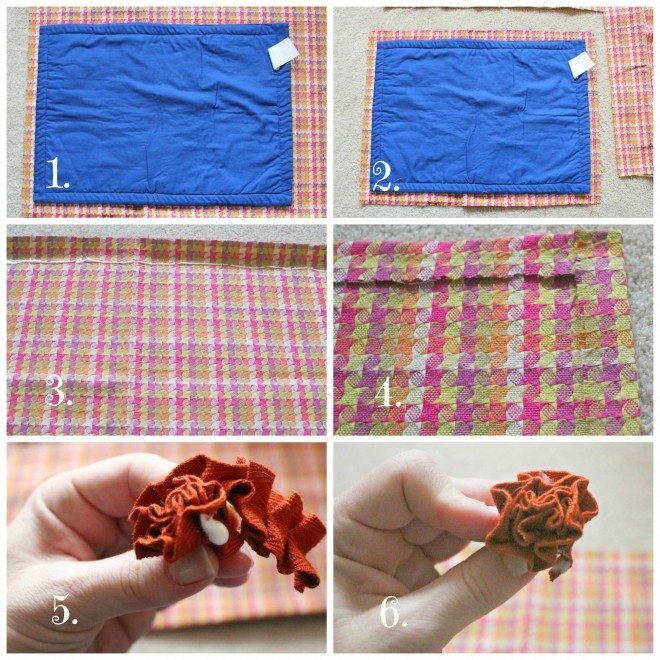 Using fabric glue is a genius idea! Thank you’. I also have butterflies I can safety pin to the runner and it will be beautimous! Thank you!! Your table linens sound like they will come out beautiful. I’m happy to inspire. Thanks so much for stopping in. Oh I love this! So easy… I’ll let you know how it went for me hahahha I really loved it!!! Would you link this up at my new Link Party Bewitch Me & titi??? It’s tomorrow! This is great…I do sew, but I really don’t enjoy it! I was aching for some springy placemats, but just couldn’t bear the thought of lugging the machine out (it always misbehaves anyway)! Thanks for the inspiration and the shortcut! I’m happy to help Kim. I’m all about doing things simply. this is SO great and easy!!!!! do you think something larger would work? table runner or tablecloth? It’ll definitely work for a table runner and I’d think it would work for a tablecloth too. So pretty and so perfect as we head into warmer weather. Great how-to! Cute! I think I need to do more with fabric glue. It’s so quick and easy. Thanks for sharing! I am having a DIY link-up party every Monday in May. I hope you can come check out the details and link up! Love that fabric! So stylish and colorful!! 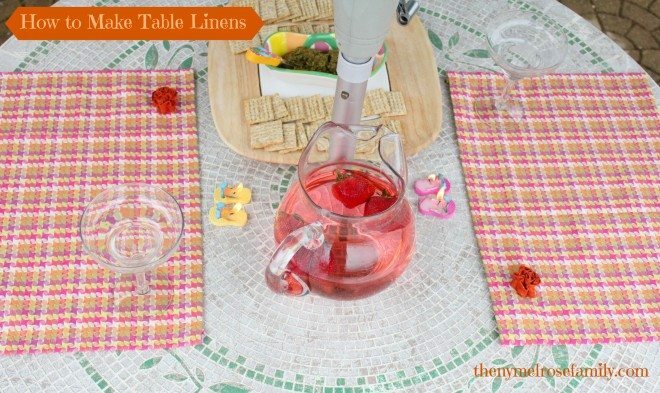 Thanks for the tute – great idea to customize your own table linens! I have a sewing machine, but haven’t had time to get comfortable with it! I am hoping to make some cloth napkins and table cloths soon, so this had some great ideas! I’m glad I could help Linda. I never worked with fabric glue. I can sew if I want to, but I never want to, except buttons. This sounds wonderful for me. Can you wash these in the washing machine without them falling apart? I haven’t tried yet Susan so I’m not positive. Jenny, I can sew but haven’t in a while and honestly, If I don’t have to sew, why should I? Love these and now I’ve got a reason to go stock up on some cute fabrics! Nice post Jenny! table linen look elegant on your table. I will surely try this at my home. Even I would like to know if these can be washed in washing machine.